When the winter covers the Salzburger Land in pure white, then the hour has come for the snow and ski holidaymakers. In the winter season the Gastein Valley shows itself from one of its most charming sides. The sunny ski slopes of the ski region Ski amadé swarm with skiers and snowboarders, and on the cross-country ski trails in the valley, Nordic sportsmen have leisurely rounds. In Bad Hofgastein and its surroundings, the winter shows itself in all facets – and everybody is in. From the Thermenappartements of our apartment hotel in Bad Hofgastein you will not have to go far to enjoy your winter activities. Thanks to its premium location right at the Kurpark in Bad Hofgastein you will find yourself only 300 metres from the Schlossalmbahn which will take you to one of the most beautiful ski regions of the Gastein Valley. Also, the ski regions of Dorfgastein-Großarltal, Graukogel and Sportgastein are very near – in total, 200 well-groomed piste kilometres will lie to your feet with the Gastein lifts in the ski union Ski amadé. Our tip: Buckle up your ski boots, step into your skis and off you go! After a jolly winter sports day, your skis, boards and shoes will find their place in the ski and ski shoe storage room of the Thermenappartements until the next day. You do not have to be a skier to enjoy the winter in the Salzburger Land. Why not go winter hiking in the mountains around the Gastein Valley, enjoy a high-spirited sledge ride or a snow-shoe hike? Especially in such moments, everyday life’s stress falls off and gives way to recreation – a wonderful idea, don’t you think? After an active winter day, it will be a pure blessing to go to the sauna, just a few steps away through the underground, heated passage. 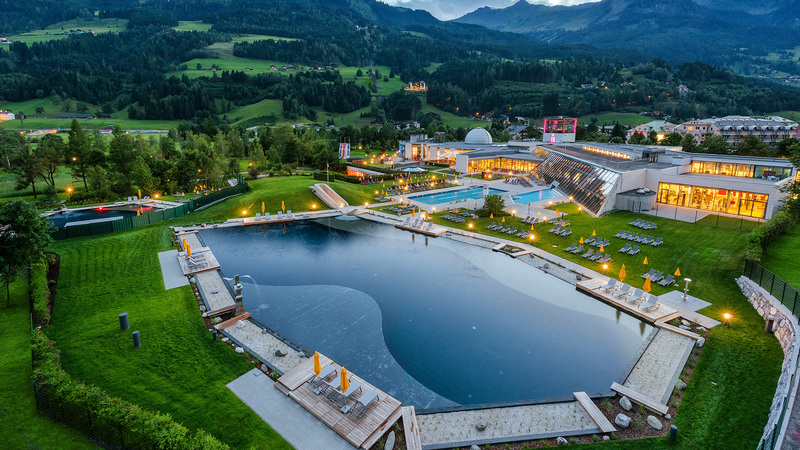 Or take a swim in the thermal pool of the Alpentherme Gastein. Of course, it is free for our guests because we are a premium partner of the Alpentherme. Book one of the top modern apartments in Bad Hofgastein for your winter and ski holidays in the Salzburger Land! Carefree days in the snow-covered mountains will await you. We are looking forward to you!